ps. 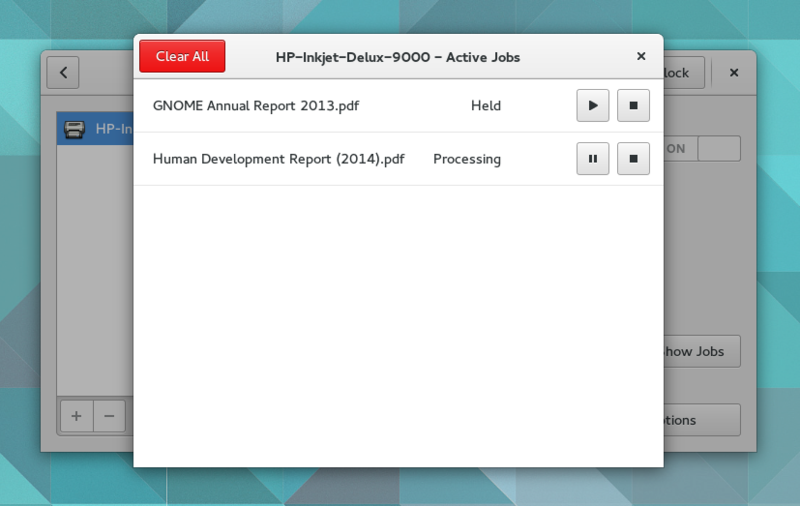 : since it is a big UI change and we’re close to a release, this new design will probably feature gnome 3.20. How do you delete a print job? It seems like you delete on at 0:14 at the video but you don’t see how. Is there a keyboard shortcut? Maybe it would be good to have a button to make it easier to discover the functionality? Hi! The job at 0:14 was Processing. It became Complete, therefore it disappeared. You could arbitrarily Stop (delete) a print job by pressing the stop button (the one on the right). In this concept you could Pause a job (putting it on the “Held” state); “Execute” a paused (held) job; Stop a job (cancel it). I kept the same job states and actions from the old jobs dialog. For nautilus the design leave the completed/paused/stooped/canceled jobs visible until the dialog/popover is close. Could be nice to have the same behavior here (Allan did the designs, so probably will agree here, but better ask). Now I realize that it might be something I understood wrong from Allan designs. I should’ve kept the Completed items on the list because that’s the reason of having the Clear All button. It makes me wonder whether we should Clear All listed jobs or just the Completed ones. We will have plenty of time to discuss these features, since it’s targeting gnome 3.20. Thanks for the heads up, Carlos. I dont know if it changed in recent gnome versions, but i always found it annoying that i had no indication if something is in print. I think a notification would be useful that would open this dialog if clicked on. There’s a notification already, but It doesn’t open up the jobs dialog. That’s a good idea. Thanks!